Solar Illuminaire Garden Ornaments - Solar Powered Garden Decoration Add to Flipboard Magazine. Are you ready to try Solar Powered Garden Decoration? Light up the garden at night. Solar Powered Garden Decoration gives us the option to enjoy our garden even at night. Since it is solar powered, it is costing us nothing to enjoy the beautiful glow from the solar yard ornaments. Echo Valley calls them “ Illuminarie” because they really do illuminate light out of the glass. Each piece is hand blown glass. This will make them come alive with the imperfections of the glass and the beautiful colors. These look pretty by day, but by night they come alive. A subtle glow will last for hours, even if you aren’t out there. Our solar powered garden decoration lasts till way in the early morning hours. I didn’t realize it would last that long. 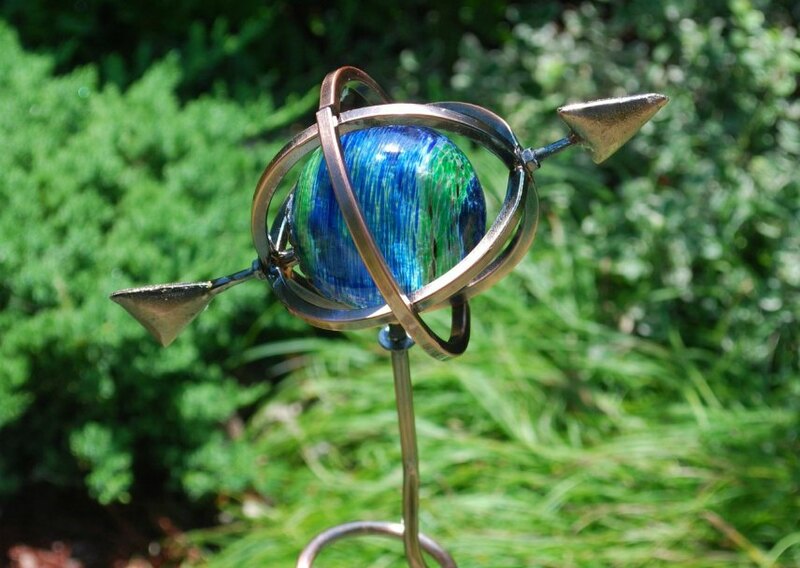 The Armillary solar powered garden decoration is about 33.5 inches tall. The perfect size to stick in flowers that stand a bit taller. My wild Tiger Lilies would be really pretty with one of these inside the long leaves. During the day it would look like a decoration, but at night it would add a soft light to my beautiful flowers. They suggest you take this inside for the winter if you live in areas that get extreme weather. Can you just imagine yourself at the end of a long day, walking down your illuminated garden path. Warm, soft garden lights bounce off your beautiful flowers and guide you to a comfy chair at the end of the path. Perfect way to end a day, just you and your garden haven you have built. These stand about 34 inches tall. 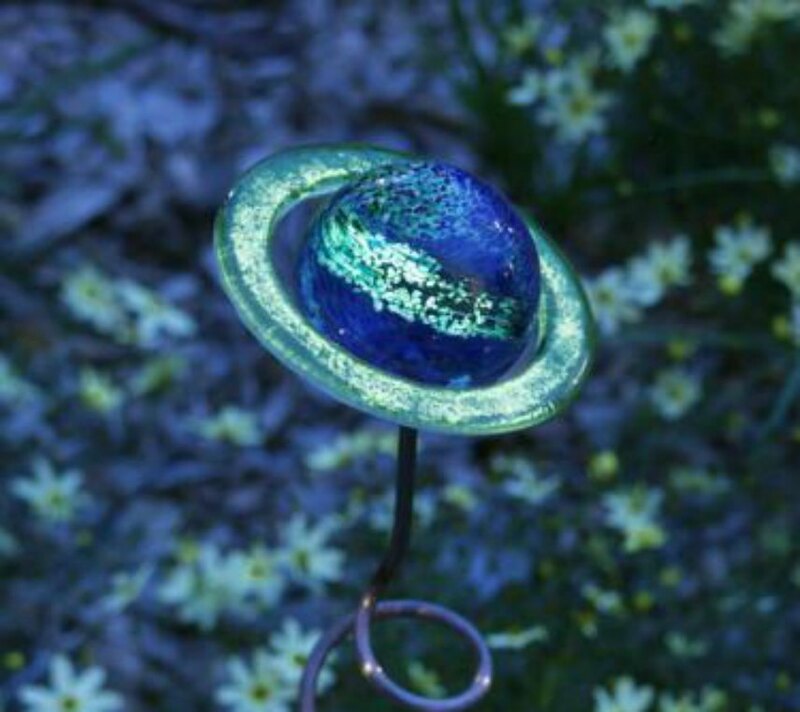 They are each sold separately, so you can have them all or just choose which solar powered yard art pieces you like. There is no assembly required. Just open the box and stick in the ground where the sun can find it. These are so adorable. I can’t have just one. Each globe is made with a durable antique copper powder-coat finish, so it will withstand any weather that is in your area, whether its the heat in the south or the strong cold winters up north. But I would suggest you bring it in for the harsh winters. 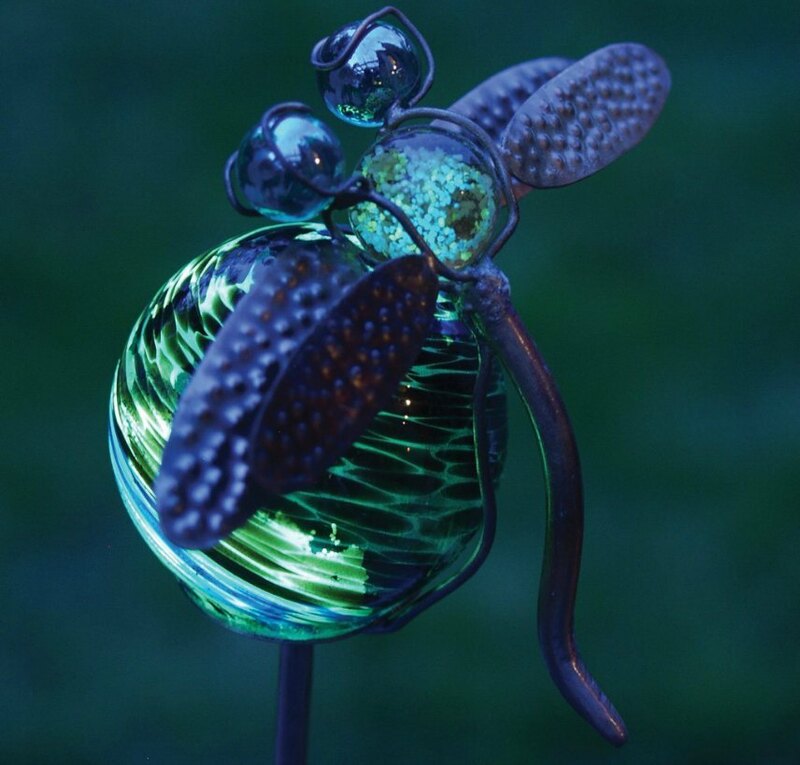 Echo Valley Illuminarie Glow Crystal Dragonfly features an ornate dragonfly perched on a globe. It is small, so you might want to put it in a pot or tucked away in the garden. Since it is small, it won’t give off as much light as the bigger ones. It is so beautiful and will add another interesting feature to your garden, day and night. Saturn solar powered yard ornament is about 33 inches high. The ring around Saturn glows as well. This will be a conversation piece for friends and neighbors as you visit in the garden or over the back fence. Don’t be alarmed if you have to keep adding to your collection of solar powered ornaments. Once you have one, you will other places that need an extra touch of a nice glow. 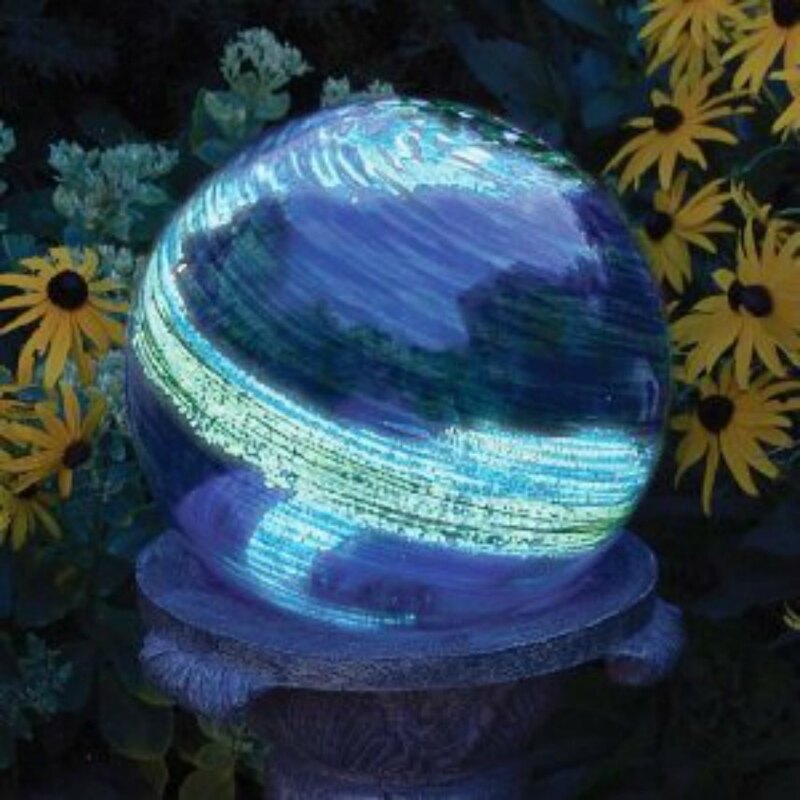 For years people have put glass globes in their garden because they are beautiful. I never really understood the draw to them. But if they glow in the dark, well that’s a different story. How pretty! It may be old fashioned, but try a solar powered globe ornament in your yard this year. There are different sizes, so if you don’t want a huge one, start with a 4 inch globe to see if you like it. I think you will. Choose from 4, 6 and 14 inches for this globe size. The smaller globes would be perfect for potted plants. I think I might stick some in my indoor plants as well. That would be pretty to see them glowing at night, like a nightlight. I bet the grand kids will like that. 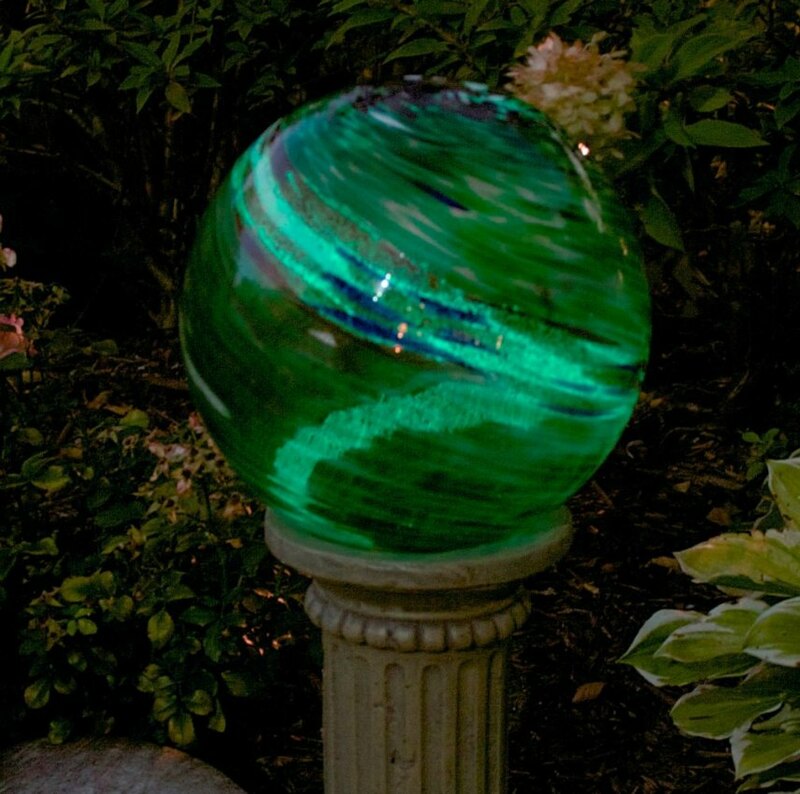 This amazing green swirl globe that is another beautiful solar powered yard ornaments, measures 10 inches, so it’s a nice size. After being charged all day by the sun, it will emit a soothing light green glow. That will look so cool with the garden plants around it. These aren’t really meant to light up your path. These are just accent lights that will make your garden beautiful by night. 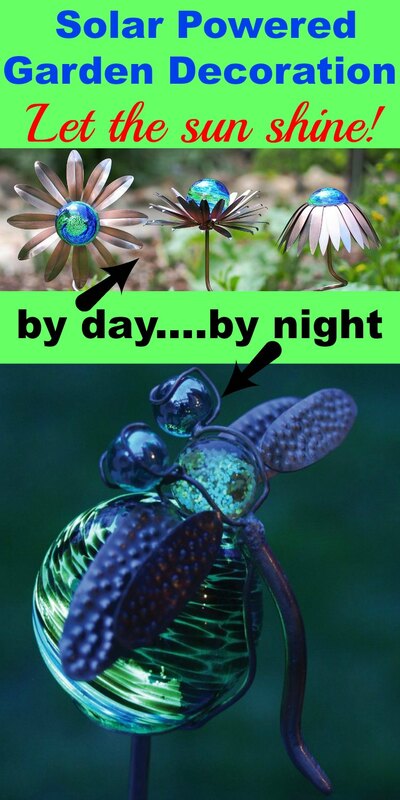 There are many more of these, so you might want to click through one of the products to see the rest or to refine the search to get exactly what you are looking for in a solar garden ornament.